The chairman of the National Newspaper Publishers Association, a federation of more than 200 Black-owned newspapers, says the Washington Redskins’ team — under fire from a Richmond, Va. publisher — is in sync with the entire National Football League in its apparent oppressive treatment of Black businesses and consumers. 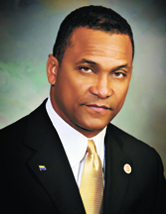 Brock, who has served as NAACP chair since 2010, is vice president for advocacy and government relations for the Bon Secours Health System, Inc., in Marri­ottsville, Md. Boone believes her corporate position has caused her to compromise her stance for economic justice in the Richmond case. In her email to the Trice Edney News Wire, Brock also clarified that the NAACP has long stood against the Redskins name because of its roots in racism. “The NAACP passed a resolution more than ten years ago against racial slurs being used as mascots. In the last few months the NAACP signed on letters with the Oneida Tribe, based in Washington and the National Coalition on American Tribes especially in support of their efforts to change the Redskins name,” she wrote. Meanwhile, Boone, a recipient of the State NAACP's Oliver W. Hill Freedom Fighter Award, remains focused on his quest for economic justice, promising Brock “fairness and balance” in upcoming coverage of her leadership positions with the NAACP and Bon Secours.